As a music school, we are very particular about sound and noise, especially since we conduct many music classes and in-house voice recording sessions. Soundzipper helped us to conceptualize the soundproofing requirements for our school, and also made sure that the work was done to our expectation. Our students have a great learning experience now, thanks to Soundzipper! Soundzipper was commissioned by Intune Music School to do the acoustic design for their new music school at Pomo Mall, 1 Selegie Road. The main challenge of the project was to fit 6 different music rooms into an area of approximately 1000 square feet while achieving proper sound isolation between adjacent rooms. Two rooms, the recording room and the piano room had to be given special attention due to their specific noise requirements. There was also a limit on how massive the construction could be due to limited space in the music school. Soundzipper performed transmission loss simulations for different wall assemblies. We eventually settled on full height walls ranging from 87.5mm to 175mm thick. The 175mm thick walls were double stud assemblies with Quiet Glue applied as a viscous damping interlayer between 2 layers of gypsum board. To preserve the acoustic integrity of the wall assembly, special care had to be taken to acoustically backfill all recessed electrical outlets. Expanding closed cell foam was used for all mechanical penetrations to form an airtight seal. In order to minimize noise ingress and egress from these rooms, Soundzipper installed custom 45mm solid core veneered doors with acoustic seals and equipped with vision panels. 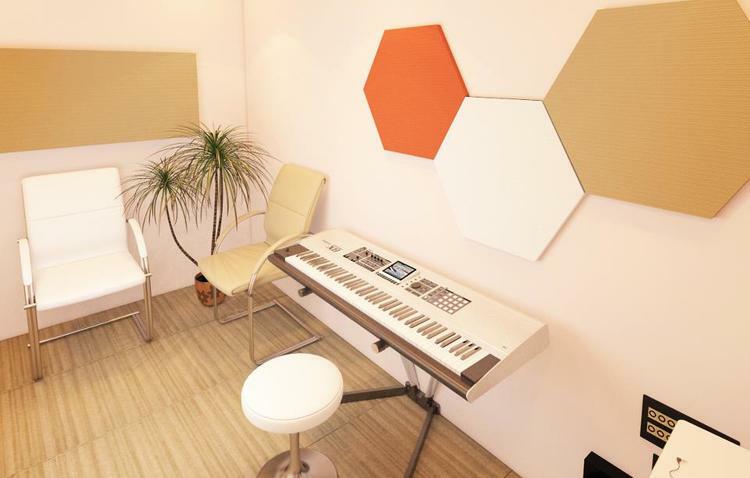 For acoustic treatment, Soundzipper started by first performing auralizations of the singing, piano and recording rooms. The client was shown these simulations and was briefed of the potential acoustic problems. For the recording room, we eventually settled on Vicoustic Vixagons with fabric colours chosen from the music school’s corporate colors. For the other rooms, the client decided on our custom fabric wrapped foam panels with fabric colours matched harmoniously to the designer’s colour choice for each room.